Many cannabis consumers and laypeople are familiar with sativa and indica, the two species (or sub-species, for those keeping score) that compose the dual world of marijuana. Sativas, the more rare species, convey an uplifting, energetic, and euphoric high that is good for those suffering from depression and PTSD, whereas the more common indica delivers a solid body buzz, pain relief, and the munchies and is good for insomnia, arthritis, and those undergoing cancer treatment. What many don’t realize is that there’s a third cannabis cousin typically not considered by patients and cultivators: Ruderalis. Hailing from Central and Southeastern Russia, this variety produces poor yields and contains little THC, giving it no value on the black market. It can be found today throughout China and Russia. 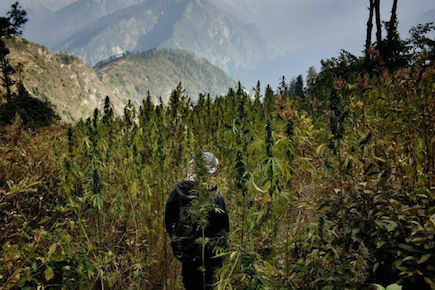 Ruderalis is the most hardy type of cannabis, however, able to withstand conditions in the northern Himalayas region and southern states of the former Soviet Union that would kill sativa and indica strains. The word “ruderalis” is derived from “ruderal,” a botanical term used to describe hardy, non-domesticated plants, including weeds. Cannabis ruderalis was first discovered in 1924 by Russian botanist D.E. Janischevsky, who was studying cannabis along the Volga River. What makes ruderalis special is its ability to autoflower. Unlike sativa and indica strains, which require a change in light cycles to bring on the flowering stage of the plant, ruderalis needs no such illuminatory nudging. It does not grow wild at latitudes south of 50 degrees north of the equator. The recent focus on tinctures and other medical cannabis preparations high in CBD and low in THC — perfect for treating conditions like childhood epilepsy — has renewed the focus of many gardeners on ruderalis. Strains low in THC are being embraced for their ability to deliver the efficacy of cannabis without the psychoactivity provided by THC. Although many label ruderalis a species or sub-species of cannabis, a 2005 study found little genetic justification for considering this odd man out of the marijuana world a separate species. Some researchers and breeders believe ruderalis to itself be an ancient hybrid of indica and sativa genetics.